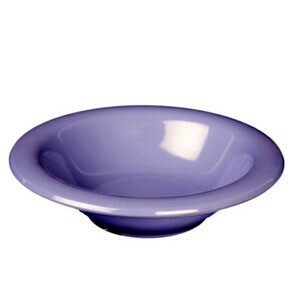 A must-have in any food service establishment, the Thunder Group CR5716BU Purple Melamine Soup Bowl 18 oz. is perfect for serving soups, stews, and other specialty dishes. This economical piece of dinnerware has a smooth white surface and a footed base for stability. Designed for convenience and functionality, this NSF approved soup bowl is made from break-resistant melamine that will withstand the demands of high-volume settings. 13 oz. - 18 oz. $32.99 GET Enterprises 0180-BK Black Elegance Melamine Bowl 8 oz. $32.99 GET Enterprises 0180-TD Japanese Traditional Melamine Bowl 8 oz. $32.99 GET Enterprises 0180-TK Tokyo Melamine Bowl 8 oz. $32.99 GET Enterprises 0172-TD Japanese Traditional Melamine Bowl 12 oz. $32.99 GET Enterprises 0172-W Water Lily White Melamine Bowl 12 oz. $35.99 GET Enterprises 150-1-TD Japanese Traditional Melamine Bowl 8 oz. $36.99 GET Enterprises 207-45-TD Japanese Traditional Melamine Bowl 10.5 oz. $36.99 GET Enterprises 207-45-TK Tokyo Melamine Bowl 10.5 oz.